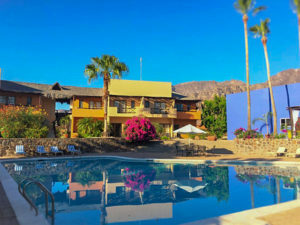 My first visit to Loreto nearly a half-century ago stimulated my life-long fascination with Baja that seems to be insatiable. 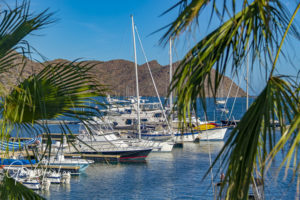 Development in many of the more popular Baja destinations, i.e., Los Cabos and La Paz, seemed to explode over the years, while Loreto, the oldest city in Baja, seemed to take a slower, more deliberate growth path. 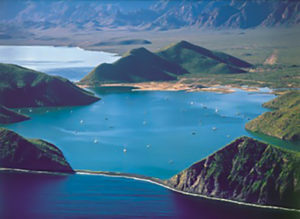 Along with the six offshore islands in the Sea of Cortez, Loreto has been protected by the Federal Government since 2000 as the Bay of Loreto National Park, preserving it for future generations to enjoy. 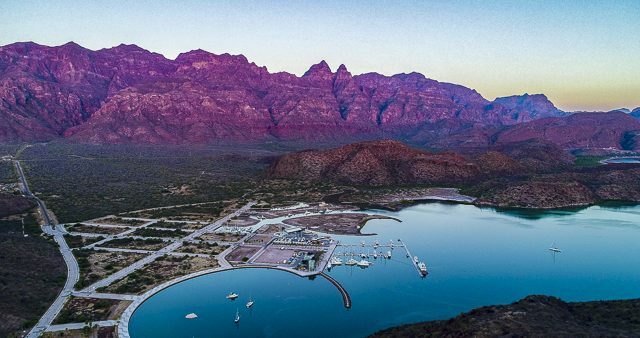 UNESCO further recognized Loreto as a World Heritage site. A trailer park sprang up onshore to serve long-term boaters in need of a home base and a general store was opened to serve the boaters and the cruisers as well. Then, along came a hotel with an excellent restaurant. Tripui, the name of the little RV park, is also the name of the pueblo that grew up after a devastating fire in 2004. Puerto Escondido had been a haven for small sailboats that could anchor out, protected and totally free. They could afford to stay there for months on end. marina with dockside services at Puerto Escondido and began charging for the privilege of anchoring out. The infrastructure included dredging the entrance channel, creating two of the three planned artificial residential islands in the bay; constructing an ellipse with seawall and jetty; bringing in a water treatment plant and roads; building the marina, launch ramp and dry storage. In 2005, the Bank foreclosed on the dredged island’s residential real estate, which some of the current Marina Puerto Escondido partners purchased. In 2016, the current company, the Hamann Brothers, together with JEP Real Estate, created a partnership combining assets purchased from the Bank and FONATUR. 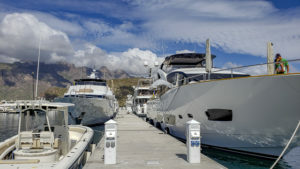 t owners to take advantage of the natural hurricane protection that the marina offers with more than 100 slips for large yachts with drafts of 12 feet or more. The aluminum docks were designed and manufactured in Canada and installed at the marina by PORALU. The floating concrete breakwater was designed and manufactured in Ireland by ICMS, which also installed them. 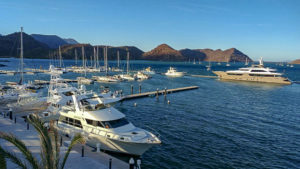 Marina Puerto Escondido now accommodates mega-yachts to over 200 feet, with power pedestals fitted with 50 amps, 100 amps, single or three-phase service with 480V outlets available for larger boats. 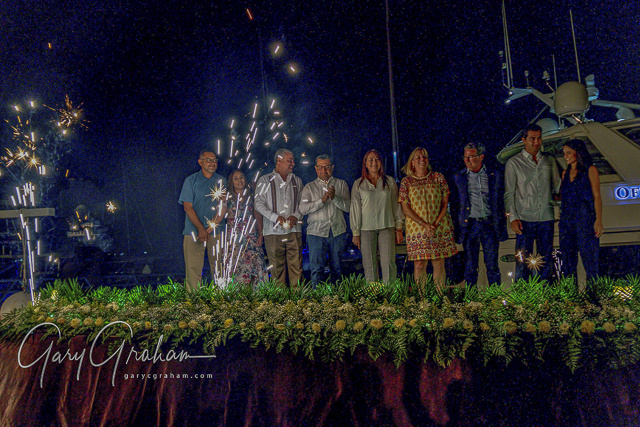 I recently attended the Grand Opening of the Marina Puerto Escondido (hidden port). Throughout the afternoon, guests arrived – some who had traveled thousands of miles to join in the celebration — such as long-time friends of Curt Hamann — Klaus and Anne Marie Andersen from Denmark. Loretanos were joined by visitors, political figures and other dignitaries all eager to observe the many improvements. 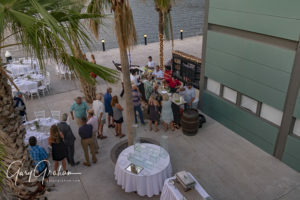 As old acquaintances were renewed, and new ones established, the crowd swelled as the 5,000-foot tall colorful rock wall of the “Sierra de la Giganta” changed to a deep purple when the Baja sun began to set. 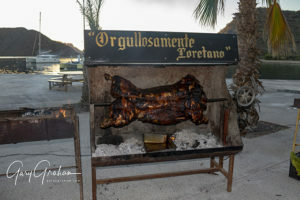 The final touches to the lavish, traditional “Spit Roasted Pig” buffet were completed and everyone was invited to take their seats at the elaborately decorated tables with beautifully unique views of the marina. 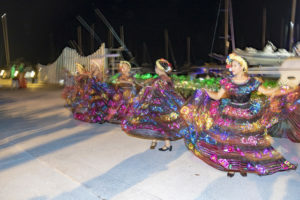 During dinner, a local Mexican dance troupe performed, to the delight of the crowd as the wait staff hovered over them. • and other federal, state and municipal authorities. Salcedo continued, “Today is very special for me, because today, after a long time and a lot of effort, one of our dreams is being fulfilled – (one of our dreams because it was not only mine, but that of my family and my partners as well). “We have been investing in this project for more than 14 years and finally we can see that it is becoming a reality! “What all of you are witnessing here is only the beginning of the transformation of Puerto Escondido. has more than 100 slips for boats up to 200 feet long, as well as the first stage of our real estate development, “Waicuri,” where we just finished the first of 30 houses that we have planned. 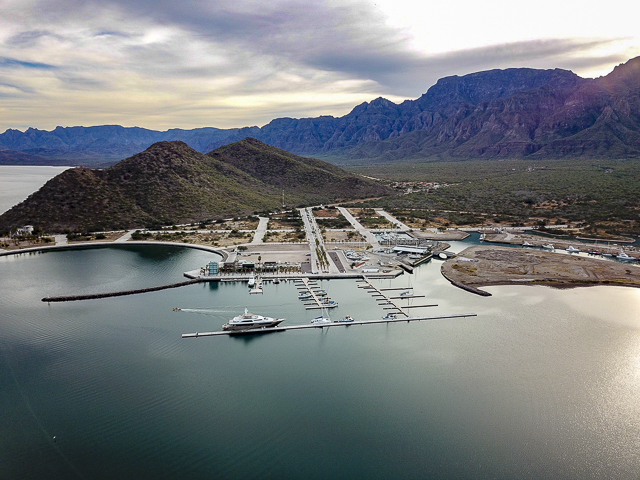 “I hope that all Loretanos share the pride that I feel by having the only project in our state with homes that have private docks available, all within a protected natural park in the heart of the Sea of Cortez. “I would like to give a very special thanks to my wife for her unconditional support and invaluable company. “To my dad, for his great vision, for his constant advice and for giving me the opportunity to lead this project. “And of course, to our partners Jeff, Gregg, Curt and Manuel for the trust they have put in me, and my family. “To my brothers, especially to Paulina, for the time and effort dedicated to this first stage of the project. Without it, it could not have been achieved. “To all government agencies that in one way or another have been a part of this project. “To our loyal customers who keep us motivated to offer a better service. 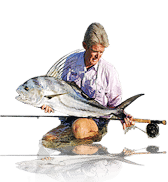 “My dad, Robert Hamann’s first trip to Baja was in the mid-1960s, when the main dirt landing strip was in the wash just south of Loreto, long before the landing strip southwest of Tripui was created – which was walking distance to Marina Puerto Escondido! Nothing was as rejuvenating for him and his buddies than a few days of fishing and snorkeling in the Sea of Cortez. In the late sixties, he began bringing his sons … and we fell in love with Loreto. My first unassisted yellowtail success story was from the Loreto pier! Hooking and landing fish became a rite of passage for the Hamann brothers with fond memories of catching sierra and roosterfish from the shore at the channel entrance! “Dad had a work-hard, play-hard lifestyle and the islands of Loreto couldn’t have been a better playground. 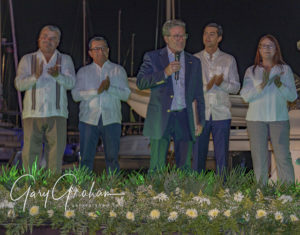 I have no doubt he would be absolutely thrilled to know his sons are investing in world-class infrastructure and services at Marina Puerto Escondido. He would be amazed to see 165-foot mega yachts safely tied to the breakwater we are inaugurating today. Loreto providing employment opportunities for many years to come. It is our goal to favor, when possible, the offering of jobs to Loretanos. Three new private homes will begin construction soon and we are pleased to have recently learned from FONATUR that our elevation variation for 4-story condominiums in the ellipse has been approved. “We are particularly grateful for the support of Governor Carlos Mendoza Davis, API director Lic. José López Soto and Loreto Municipality President Professor Arely Arce Peralta. They have been key collaborators in the journey to resolve years of obstacles which have prevented the realization of the potential of this magical place. “Gratitude also to our PORALU colleagues who are with us today for the world-class breakwater and slips which we are inaugurating tonight. We are very satisfied with the pre-event testing they organized with 80-mph Sergio Tropical Storm winds which successfully demonstrated that their engineering and equipment is indeed safe and effective in serious weather. structure now takes this to a new level. Premium Service is all about the people! The Marina Puerto Escondido team is fantastic. 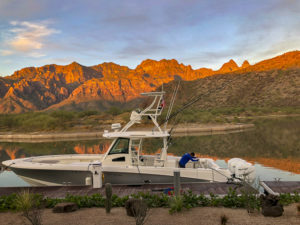 Escondido was a welcome addition that would change the face of boating and sportfishing in the region in the coming years. The final official act of the evening was the ribbon cutting with fireworks that underscored the significance of the event. With more dancers and plenty of chatter among the guests about the new facility and its impact on the area, the event continued late into the starlit night. 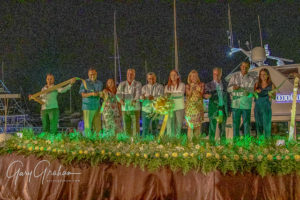 No one was willing to leave the “feel good” camaraderie that existed as Loretanos, government dignitaries, politicians, developers and investors shared the spirit of accomplishment that had turned this slow-growing community into a world-class tourism venue.